The tools have been reordered. We expect our shipment by August 15 if not sooner. If you order, know your package will be delayed a bit. your store this ruler please have them email us and we are happy to direct them to the distributor! Sew together 24 of these 15 degree triangles to create a complete circle; 12 to create a half-circle; or 6 to create a quarter-circle. 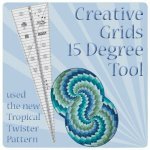 Create circles up to a finished size of 48 inches. Total ruler length is 24.5". Use the vertical lines to fussy cut stripes or cut half triangles (the 1/4 inch seam allowance is marked). Or cut 30; 45; 60; and 90 degree units with the angles marked on the ruler. 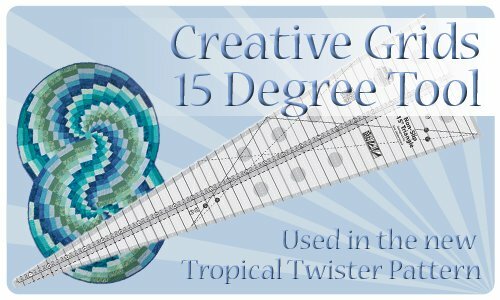 Don't forget to order the Tropical Twister pattern!